last night i sent out this lovely e-mail that some of you had trouble viewing. ah, technology. so, i decided to post it for easy access. 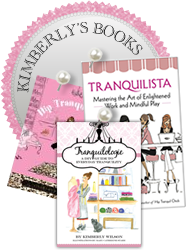 it's a listing of oodles of tranquility + festive happenings coming up may through march 2010. more scoop is at kimberlywilson.com: teleclasses, fall online creativity circle, retreats, and more! hope our paths will cross. Thanks for a great yin workshop this afternoon! I hope you don't mind but I posted about it (and about you and Tranquil Space more broadly) on my new blog.